Keeping in view the increasing and changing requirements of our valued customers, we are actively involved in offering a broad range of Signal Conditioning Modules in the market. The basic material applied in the development of these products is provided by genuine, authentic and certified vendors of the industry after conduction rigorous examinations on the used raw inputs. Moreover, these products undergo various quality checks during the manufacturing process to maintain their supremacy as per the industry. 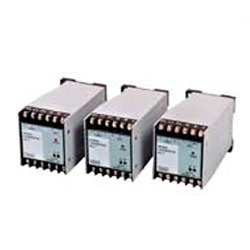 The purpose of current signal transmission is to achieve immunity to level drops from long runs and noise from motors relays, actuators, transformers, switches, etc. Normally, these are built-in transducers. The purpose of galvanic isolation is to overcome ground-loop problem and to isolate high voltage plant side from the low voltage computer side/ Instrumentation panel side. This current signal is used in control room for the indication, control, data logging, data processing ,etc. In case of isolators, normally output parameter is the same as the input parameter and more number of outputs with a single input is available. Converts various field signal from RTD, thermocouple or other signals like current, voltage , frequency, resistance or any other parameter into electrical parameter. In this case,output parameeter is normally not same as input Parameter. Both isolated and non-isolated versions available. Looking for Signal Conditioning ?